1. On a thermometer X, the freezing point of water at -30o and the boiling point of water at 90o. 60OX = ….. oC. On the Fahrenheit scale, the freezing point of water is 32oF and the boiling point of water is 212oF. Between the freezing point and the boiling point, 212o – 32o = 180o. On the Celsius scale, the freezing point of water is 0oC and the boiling point of water is 100oC. Between the freezing point and the boiling point, 100o – 0o = 100o. On the X scale, the freezing point of water is -30oX and the boiling point of water is 90oX. Between the freezing point and the boiling point, 90o – (-30o) = 90o + 30o = 120o. 2. A metal rod heated from 30oC to 80oC. The final length of the rod is 115 cm. The coefficient of linear expansion is 3.10-3 oC-1. What is the initial length of the metal rod? 3. The initial length of a brass rod is 40 cm. After heated, the final length of the brass is 40.04 cm and the final temperature is 80oC. If the coefficient of linear expansion of the brass is 2.0 x 10-5 oC–1, what is the initial temperature of the brass rod. 4. Two metal rods with the same size but different type, as shown in figure below. The thermal conductivity of metal I = 4 times the thermal conductivity of metal II. What is the temperature between both metals. The size of both rods is the same. 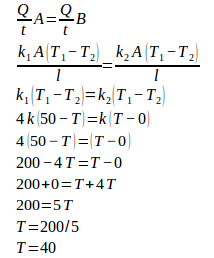 Q/t = the rate of heat conduction, k = thermal conductivity, A = the cross-sectional area, T1-T2 = the change in temperature, l = the length of the rod. The temperature at the center between both the metals rods is 40oC. 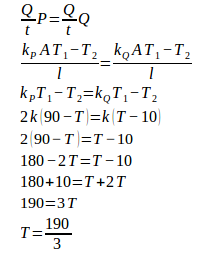 Factors that determine the rate of heat conduction on metals are…..
Based on the equation of heat conduction, factors that determine the rate of heat conduction on metals are conductivity of metal (k), the difference of temperature (T) and the length of metal (l). 6. Two rods of the same size but different type, as shown in the figure below. The thermal conductivity of rod P is 2 times the thermal conductivity of rod Q. What is the temperature between both rods. Both rods have the same size. 8. 100-gram oil at 20oC and 50-gram iron at 75 oC are placed in 200-gram iron container. The increase in temperature of the container is 5oC and the specific heat of oil is 0.43 cal/g oC. What is the specific heat of the iron? Black principle states that in a isolated system, heat released by the hotter object, absorbed by the cooler object. 9. A 200-gram water at 20°C placed in 50-gram ice at -2°C. If the change of heat just between water and ice, what is the final temperature of the mixture? The specific heat of water is 1 cal/gr°C, the specific heat of ice is 0.5 cal/gr°C, the heat of fusion for ice is 80 cal/gr. Plus sign indicates that the heat is added, the minus sign indicates that heat released. 50-calorie of heat needed to increase the temperature of ice to 0oC and 4000-calorie needed to melting all ice. Total heat = 4050 calorie. The heat released by water is 4000 calorie. Some of the ice not melting, so the final temperature of ice and water is 0oC. 10. A 200-gram aluminum at 20oC placed in 100-gram water at 80oC in a container. The specific heat of aluminum is 0.22 cal/g oC and the specific heat of water is 1 cal/g oC. What is the final temperature of aluminum? Aluminum and water in thermal equilibrium so that the final temperature of aluminum = the final temperature of water. 11. A 50-gram metal at 85 °C placed in 50 gram water at 29.8 °C. The specific heat of water = 1 cal.g —1 .°C—1. The final temperature is 37 °C. What is the specific heat of metal. 12. A block of ice with mass of 50-gram at 0°C and 200-gram water at 30°C, placed in a container. . If the specific heat of water is 1 cal.g– 1 °C –1 and the heat of fusion for ice is 80 cal.g –1. What is the final temperature of the mixture. Heat used to melting all ice is 4000, while heat released by water is 6000. Can be concluded that the final temperature of the mixture above 0oC. Heat released by water = heat for melting all ice + heat to increase the temperature of ice.